As a Toronto wedding photographer with a lot of weddings under my belt, I always advise my couples to avoid a crowded wedding photography locations. However, my couple was reticent and insisted that we use Humber Bridge as their location for the bride's unveiling. The beautiful bridge is commonly used for engagement photos, and in my experience, one has to shoot early in the morning to avoid the large crowds. Even more, the bride and groom chose to have their first look at 1 p.m., the worst time for photography. Despite the complexity of the situation, this is a beautifully executed image. To be able to capture such an important moment of the wedding day, I had to orchestrate this photograph. As such, I asked the groom to wait for his bride and photographed her walking towards him. Out of the many frames, I shot during the first look, this is my best. First, the image captures the movement of the bride as she's immortalised in midstride. Also, the groom has a surprised look on his face as his bride is kissing him. His right hand is holding the brides' hand why his left is hanging, indicating the speed of the moment. Second, the bride and groom are positioned on the right guideline of the frame according to the rule of thirds. 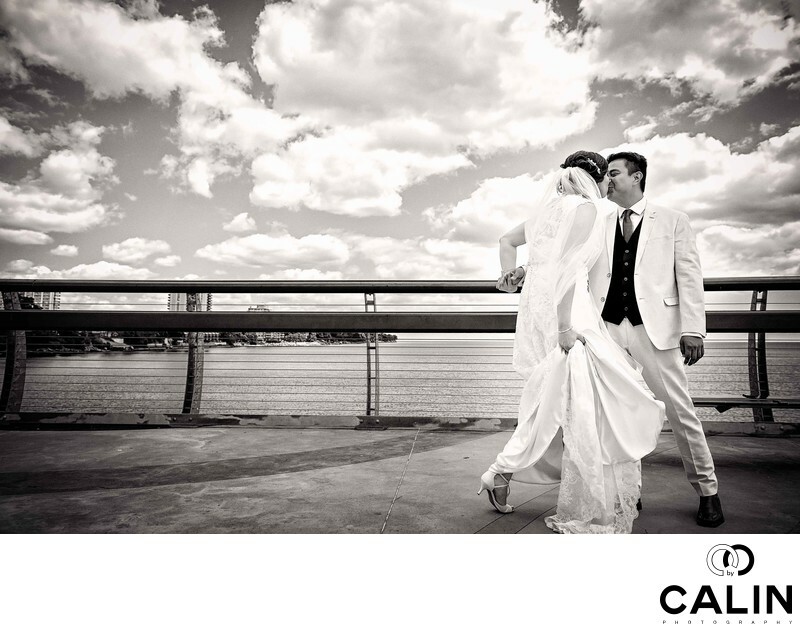 The railings of the bridge constitute leading lines a directing your eye straight to the couple. This wedding photo has a documentary feel. As a matter fact, despite the fact that I direct loosely that such moments, the brides and grooms are free to do what they want. I always encourage them to show their emotions because that makes for great wedding photos. This particular summer day the sky was an intense blue, and both the bride and groom were wearing white outfits. First, I processed the picture in colour and noticed that the multitude of colours was competing with my subjects. As such, I went a step further and applied a black and white processing which I like more. In such situations, I often deliver both wedding photos, the black and white and the coloured one. Another important element of the post-production phase was to increase the drama in the picture by increasing the texture of the backdrop. This environmental wedding the portrait of the bride and groom is one that my prospective clients love. They often comment how natural this moment looks and how well I captured it. What makes it such a good photojournalistic wedding portrait? First, there is a sense of movement in the frame. Second, the groom's surprised facial expression consolidates that documentary feel. Third, the black and white processing gives a hint that we are viewing a candid photograph. Here are a few technical aspects of this photograph. I used a 24 to 70 lens to capture not only the bride and groom but also the bridge and Lake Ontario behind them. To have everything in focus, I shot this photo at f7.1. Besides increasing the texture and converting it into black and white, I removed some distractive elements and applied dodging and burning in post-production. Location: Martin Goodman Trail, Toronto, ON.